This symbol of Yang and Yin is often misunderstood. It is the Symbol of Harmony! But so many, mistakenly believe that it also represents Good and Evil. Really! Do plus (+) and minus (-) fight. No, they unite harmoniously, creating something new and higher. But Good and Evil are reconcilable. They fight, meanwhile bringing so much destruction on both sides. These two quotes tell the creation of the universe. And it's purpose: Harmony. The Great One ( however you call him ) let the two energy ( yin yang ) create the heavenly world and the earthly world. Then in order to reach harmony, they must unite. So what does that mean? We humans are bodies and spirits each representing the physical world and spiritual world. We can unite them. We can unite religion and science, which also represent the two worlds, though they seem contradictory. How can we unite those two? You just have to know: religion is about why and science is about how! In the West our religious consciousness has been firmly shaped by the ontology contained in the traditional Christian doctrines on God and Creation. Even the language we use has been shaped by that consciousness and frames the science and religion debate as an unstated assumption by both the religious and non religious alike. These traditional doctrines are in turn derived in large part from the form and matter ontology of Plato and Aristotle. For example, the thought of Augustine and Aquinas, two pillars of traditional doctrine, can be considered to be Platonic and Aristotelian respectively. Beginning from John Dalton’s atomic theory in the early years of the nineteenth century, modern science has shown that this Greek ontology is not physically correct. Consequently throughout the nineteenth century and continuing until today there has developed a gap between the scientific worldview and those parts of traditional Christian doctrine dealing with God and Creation. It is my contention that in his writing on Unification Thought, Dr. Sang Hun Lee also adopted the unstated ontological assumptions of this traditional doctrine, and that this differentiates Unification Thought from Divine Principle. Unification Thought as it exists is thus shaped by Platonic and Aristotelian philosophy and contains the same discontinuity with the scientific worldview that has developed with traditional doctrine in the last two hundred years. Previously,  I showed how the Platonic dualism of form and matter is present in the Theory of the Original Image where Logos functions as a kind of Platonic form and hyungsang as an unstructured formless matter. Logical analysis of the fundamental concepts without the Greek philosophy leads to an ontological model where sungsang in general can be seen to exist as an inner four position base of a functional aspect and an informational aspect. The inner base does not exist independently of hyungsang and gives a structure more compatible with scientific explanation. This model rejects mind-body dualism and sungsang-hyungsang dualism that also find their root in Platonic thought. In addition it leads to a novel explanation of spirit realm and spiritual existence that potentially falls within the scope of scientific investigation. In this paper we turn to a consideration of the other pair of dual characteristics, yang and yin, in the context of the proposed ontological model. Yang and yin are found in oriental thought, particularly Chinese philosophy, and the Divine Principle regards the Book of Changes as an authoritative source of these concepts. Consequently we will here examine the philosophy of the Book of Changes and compare it to Unification Thought. Recall that for CPT everything is either a substance or the attribute of a substance, and wherever one substance is no other substance can be at the same time. Thus God had only two choices in creating the world. He could create it as a set of attributes (or “accidents”) with God as their substance -- but then the world would exist only as a manifestation of God, which would not leave room for personal substances to exist other than God (as in the pantheistic view of God’s relation to the world). Or God could create a world of really existing substances -- but then they must exist outside the divine substance. Hence there must be a “space” outside God “in” which this realm of finite substances has its being. Since in earlier centuries space (and time) was understood as an objective framework -- something like a big box “into” which events or objects might be placed -- there seemed to be no problem with God creating this box somewhere and then creating a bunch of substances ex nihilo to place into it. With this you have the creation narrative of CPT, and one still widely assumed by theologians today. Our common-sense way of thinking of the world has long since lost all touch with the substantivalist manner of speaking, and philosophers no longer appeal to it as a significant resource for resolving debates. Yet its influence on theology continues to be immense, since CPT was institutionalized into credal statements that silently presupposed it. Clayton goes on to point out that classical philosophical theism is facing a major crisis today. He gives a number of reasons for this, but of particular importance for this work is that he clearly sees it as physically incorrect. That is, natural science does not agree with the philosophical view of existence based on substances. Lee’s treatment of yang and yin can be seen to derive from an application of this traditional concept of substances to sungsang and hyungsang. This in turn leads him to make a distinction between Unification Thought and the Book of Changes (section 3). Unification Thought is consistent in its discussion here, but in using a substantive ontology it suffers the same problems Clayton ascribes to classical philosophical theism. Extending the previously proposed model for sungsang and hyungsang to the discussion of yang and yin leads to an explanation of these concepts that is continuous with the explanation in the Book of Changes. The understanding of yang and yin can then be shown to be complementary to science rather than inherently conflict with it. To set the scene, let us first examine the concepts of yang and yin in Divine Principle. 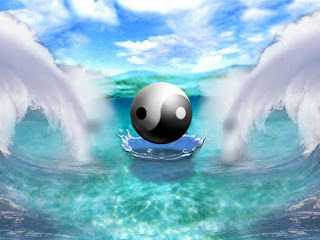 Exposition of the Divine Principle devotes little more than a page to its explanation of the concepts of yang and yin. The most important points are reproduced here. Divine Principle therefore primarily regards yang and yin as masculinity and femininity, and traces this through living species multiplying and maintaining their existence though male and female beings. When applied to inanimate matter, yang and yin are seen to be reflected in positive and negative electrically charged particles. In addition to these interactions between beings, yang and yin is also seen in correlative aspects of every existing being. Every creation exists with correlative aspects: inside and outside, internal and external, front and rear, right and left, up and down, high and low, strong and weak, rising and falling, long and short, wide and narrow, east and west, north and south, etc, The reason for this is that everything is created to exist through the reciprocal relationships of dual characteristics. Thus we can understand that everything requires for its existence a reciprocal relationship between the dual characteristics of yang and yin. Divine Principle appears to identify two types of yang and yin relationships: those between separate masculine (yang) and feminine (yin) beings, and those in the correlative aspects of each existing being. As can be seen in the above quote, the correlative aspects seem to arise just from the tangible physical manifestation of an existing being rather than from any property of what the being is made of. Thus these correlative yang and yin aspects can operate within a single being, do not necessarily imply masculinity and femininity, and do not necessarily have any physical force acting between them. The relationship between yang and yin is similar to that which exists between internal nature and external form. Yang and yin thus have the following mutual relationships internal and external, cause and result, subject partner and object partner, vertical and horizontal. Very helpful info specially the ultimate phase :) I handle such info much.